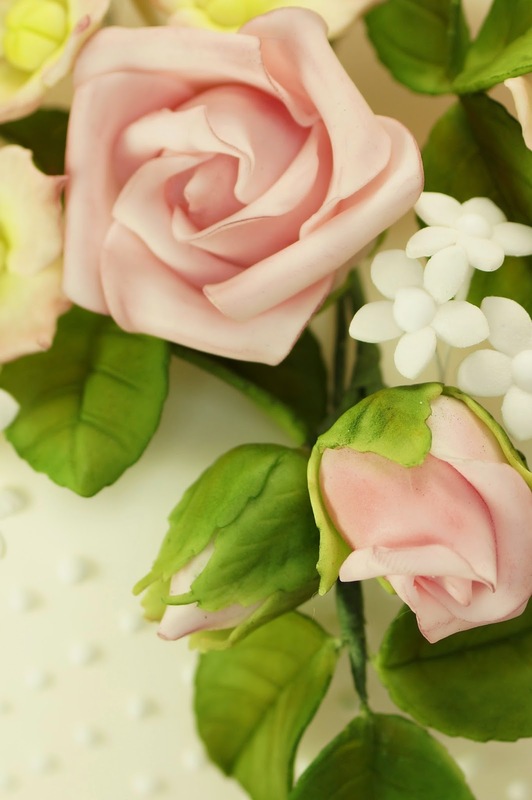 I've always wanted to attend one of Peggy Porschen's sugar flower classes, but for me, for various reasons, this wasn't practical, so, when I saw Peggy's latest book, Cakes in Bloom, I was beyond excited and pre-ordered it as soon as I could. And, as you may have noticed, things have been somewhat quiet around here since it arrived on or about 22 May 2014. 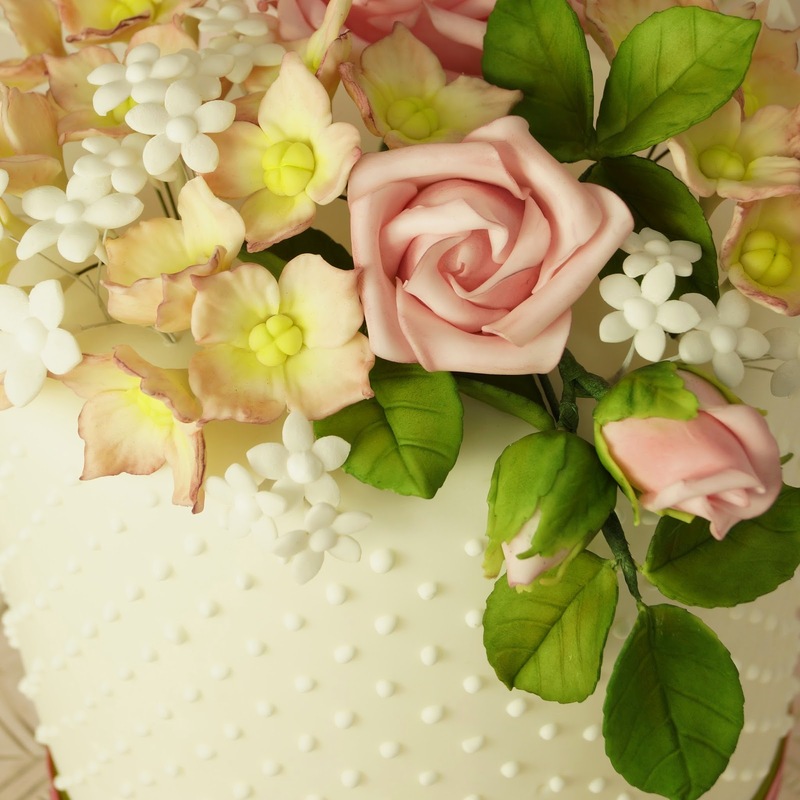 The Cakes in Bloom book is full of the most stunning floral cakes complete with instructions on how to make them. One of the best things about Peggy's books is that she includes full details, including the brands, of the cutters, veiners and colours that she used, so that you can get as close to her look as possible. 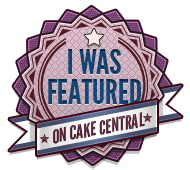 Naturally, I decided to start with a simple small cake featuring just a few sugar flowers, and then, I saw the cake on page 58 of Cakes in Bloom called "Vintage Blooms". 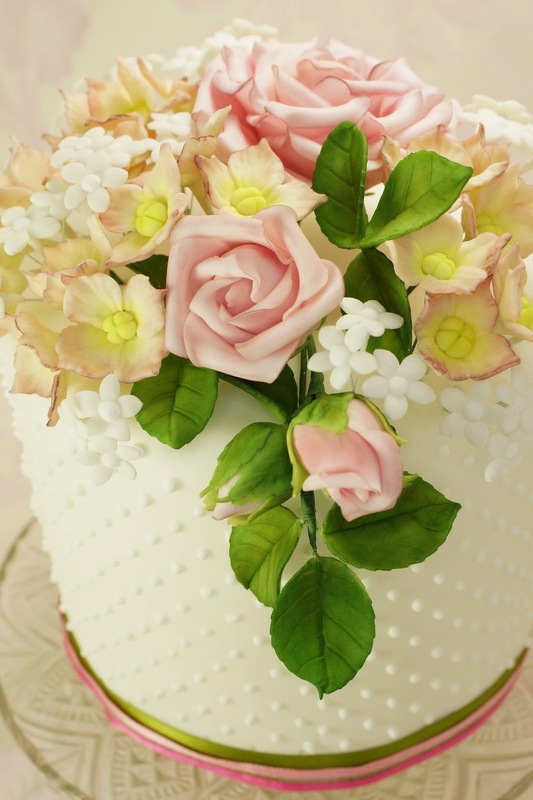 I had always wanted to make a cake like this, with the full on sugar flower effect and decided that I was up for the challenge, even though, I have never made any wired sugar flowers before. A little bit of practice in a few spare hours, over many weeks, maybe, months and here is one cake finished. Peggy's style leaves space between the flowers to give a light and airy look so that the light can shine through the flowers and I tried to do this with my sugar flower arrangement too. Peggy provides really clear instructions in her book, but, reading a book is never going to instantly provide me with the years of experience or the eye for subtle balance of colour that Peggy has. Peggy's flowers form a beautiful dome shape on her cake and although I haven't achieved the same shape on my cake, I am happy with the result, considering these are the first wired sugar flowers I have made and used to decorated a cake. Although, I know that when I look back at this cake is a year or two, I will probably cringe and want to make it all over again - a little bit better. 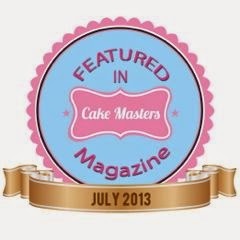 A special thank you to my lovely and talented husband Gareth, for helping me take the cake pictures above. 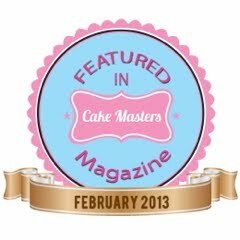 To see more about the stages of making this cake, keep reading! When I first started making sugar flowers I though that it would be the making of the flowers that would be the difficult part. 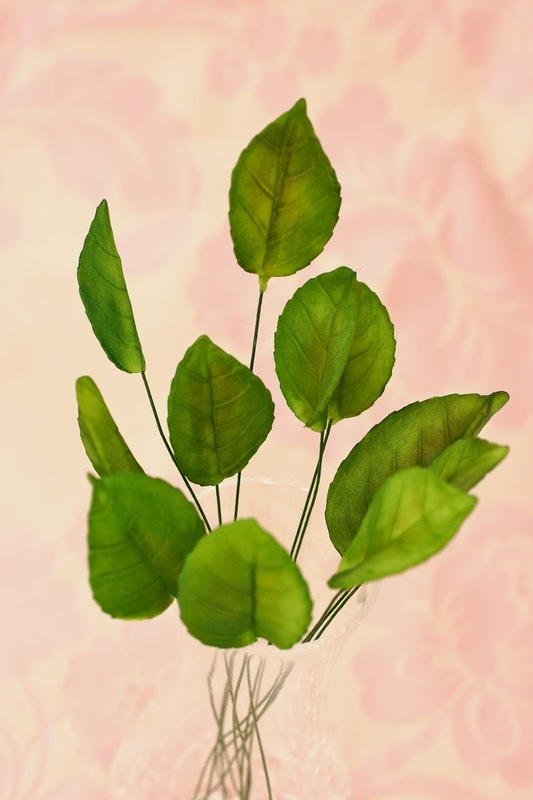 Whilst making sugar flowers, can be tricky even these ones here that are relatively simple, it turns out that that is not the hard part. 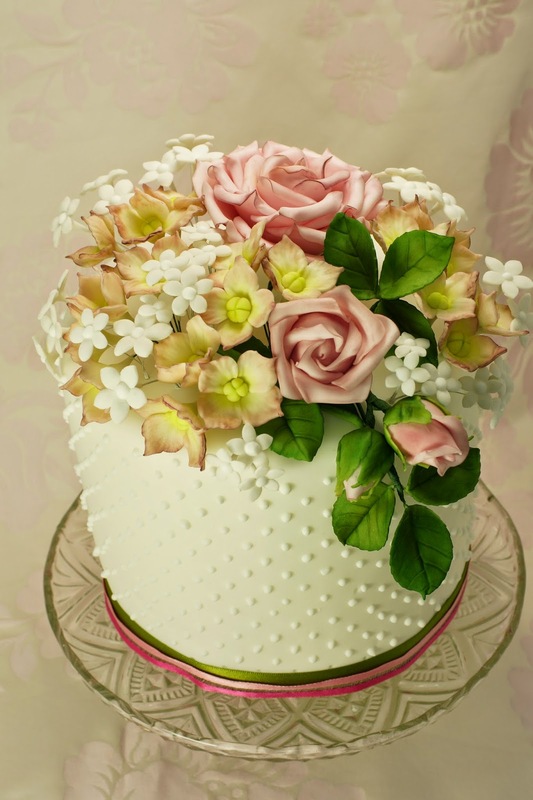 The hard part is in fact arranging the sugar flowers on a cake. Faced with a cake and a good few handfuls of roses, hydrangeas and stephanotis is rather daunting. Where to start? I followed Peggy's instructions and start by arranging my flowers and leaves into sub-assemblies. I took my sub-assemblies and started at the middle of the cake working my way outwards to arrange the flowers and I think that I just about got away with it. If I was making the cake again, I might try arranging all the flowers into one bouquet, before adding it to the cake, which is the way Peggy did hers and see how that works out.